But the good news is that someone who is well prepared can easily outshine their rivals who just sat down at the computer and hoped for the best. Theoretically an interviewer could make allowance for shortcomings in the way you use Skype, but subconsciously they are influenced by the image you project. They might also draw some conclusions about your abilities from the simple observation that you had not prepared for a call. This, they will reason, might mean you are equally careless about other things. 1. PREPARE BEFORE THE CALL. Don't be the guy who is still trying to start Skype and find the microphone when it is time for the interview to start. This will give a very poor impression and also undermines your own confidence. Always set up everything long before the interview is scheduled and test that everything works correctly. 2. PLACE YOUR CAMERA AT EYE LEVEL. Many people lean over a laptop looking down at the camera. This looks bad. Take a tip from professional video camera operators and set the camera at the same level as your eyes. If the camera is built into your laptop then raise the whole laptop on boxes or books until the camera is at eye level. 3. MAKE SURE THERE IS PLENTY OF LIGHT. Modern video cameras will work with very low light levels but the image gets grainy and the colors fade. Find a place with plenty of light from a window or arrange a light to illuminate you. Sometimes a desk lamp is enough; sometimes I use two. But always check the result so that it doesn't look strange. 4. GET THE BEST POSSIBLE SOUND QUALITY. In an interview the sound is extremely important because if the interviewer cannot hear very well they will not ask you to repeat everything so after a while they miss important points. Choose a location with little background noise. Turn off any equipment nearby and close windows to keep out traffic noise. Always use a microphone close to your mouth because this will both reduce background noise and echo. It's worth trying a few microphones to find the one that sounds best. It's worth it: that microphone could mean the difference between getting a job and getting rejected. 5. CHECK THE BACKGROUND. Look at whatever is behind you and can be seen in the video. It should not be distracting so find a clear, tidy corner to do the call. Make sure also that there are no windows behind you where people might walk past. This is very distracting. 6. LOOK AT THE CAMERA. It is tempting to look at the picture of the other person on the screen. This does not look good because everyone can see you are looking down. It's better to look straight at the camera and just glance occasionally at the screen. If you have a separate camera you can do it the way I do: I put the camera on a tripod just in front of the screen or tape it to the screen right in front of the image of the other person. 7. SMILE TO LOOK NORMAL. Video cameras tend to reduce the happiness of a face so if you look neutral in reality you look sad on the screen. Compensate by having always a slight smile so that you look natural. But test this first to avoid looking scary creepy. 8. PUT NOTES WHERE YOU CAN READ THEM. Don't keep looking down at your notes. Print them in a large font and place them on a wall behind the camera or write them on a post it and put it next to the Skype window on your computer. 9. TEST THE CONNECTION, MICROPHONE. Ideally you should make a quick call to a friend just to make sure everything is working, that the microphone level is right and so on. 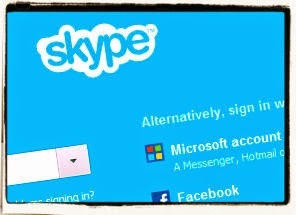 Now that many people have Skype in their phone it isn't hard to find someone to do a test call. In the worst case if no friends are available use the Skype test call function. Don't wait until the recruiter for your dream job is on the line to discover you plugged the microphone into the headphone socket. And don't begin by asking "Can you hear me?". That gives the impression you are used to failing. Just start talking as if you knew it would work. 10. SCOUT FOR SKYPE LOCATIONS. When you are doing calls from home you can identify and prepare a conveniently quiet, luminous corner for your Skype interviews. But sometimes there are only limited time slots available and maybe you have to do the call from somewhere else. Since this could happen to anyone it's best to think ahead and look around for suitable quiet rooms you could use if needed. In many buildings this is surprisingly difficult so plan ahead. Taking great care with your Skype interviews will make you stand out among the other candidates and even if the interviewer recognizes that you have done this deliberately they will be impressed that you take care to do things effectively. There are not many jobs where they are looking for people who are sloppy and careless, so this is another reason why they should choose you. For lectures, workshops, one-to-one coaching and writing about this and other communication topics you can contact me by email on conseil@andrewhennigan.com or by phone at 0033 6 79 61 42 81 or 0046 730 894 475. You can also find out more through my website http://andrewhennigan.com.